Aboriginal spiritual beliefs are invariably about the land Aboriginal people live on. It is ‘geosophical’ (earth-centred) and not ‘theosophical’ (God-centred). 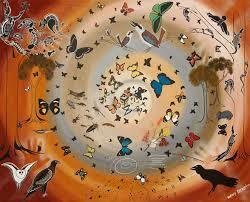 The earth, their country, is “impregnated with the power of the Ancestor Spirits” which Aboriginal people draw upon . They experience a connection to their land that is unknown to white people. A key feature of Aboriginal spirituality is to look after the land, an obligation which has been passed down as law for thousands of years. “Spirituality is about tapping into the still places I go to when I’m on country and I feel like I’m part of all the things around me,” explains Senimelia Kingsburra, from the far north Queensland Yarrabah community . This entry was posted in Aboriginal Wisdoms and tagged Aboriginal and Torres Strait Islander Commission, Aboriginal Australian, Indigenous People, Queensland Yarrabah, Spiritual (music), Yorta Yorta people. Bookmark the permalink.